A top Mormon leader made headlines this week when he acknowledged, without being specific, that past actions by church leaders may have contributed to doubts about church teachings. 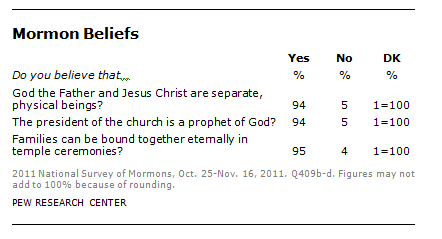 Indeed, one-in-five Mormons surveyed in 2011 said they have such doubts. “In nearly 200 years of church history – along with an uninterrupted line of inspired, honorable and divine events – there have been some things said and done that could cause people to question” church history and beliefs, said Dieter F. Uchtdorf , who is one of the three men who make up the highest governing body of the Church of Jesus Christ of Latter-day Saints. Uchtdorf was speaking to 20,000 Mormons who had assembled for the church’s semiannual general conference in Salt Lake City. A 2011 survey of American Mormons by the Pew Research Center found that three-in-four (77%) people who are current members of the LDS Church say they believe wholeheartedly in all the teachings of Mormonism. But 22% say they find some of the church’s teachings hard to believe. 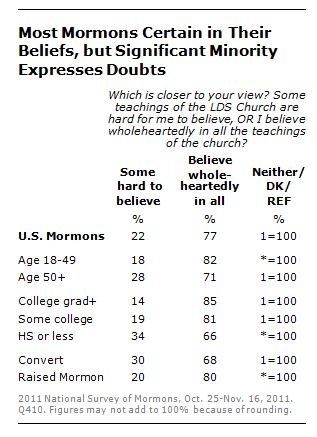 Mormons over age 50 are somewhat more apt than younger Mormons to say they find some of the LDS Church’s teachings hard to believe (28% vs. 18%). Mormons with a high school education or less are substantially more likely than those with more education to say they find some elements of Mormonism difficult to believe. Converts to Mormonism also are more inclined than lifelong Mormons to say they find certain teachings of the faith hard to believe. There are a number of tenets that are central to the teachings of the LDS church and widely-held by Mormons that are not shared by other Christian traditions. Nine-in-ten Mormons believe the president of the LDS Church is a prophet of God (94%) and that the Book of Mormon was written by ancient prophets and then translated by church founder Joseph Smith (91%). Similarly large numbers of Mormons believe that families can be bound together eternally in temple ceremonies (95%) and that God the Father and Jesus Christ are separate, physical beings (94%). In the Pew Research Center’s Religious Landscape Survey, conducted in 2007 and released in 2008, 70% of Mormons who were brought up in the church said they were still church members, while about 30% said they had either converted to another religion (15%) or were no longer affiliated with a particular religion (14%).